Justin Allgaier and the No. 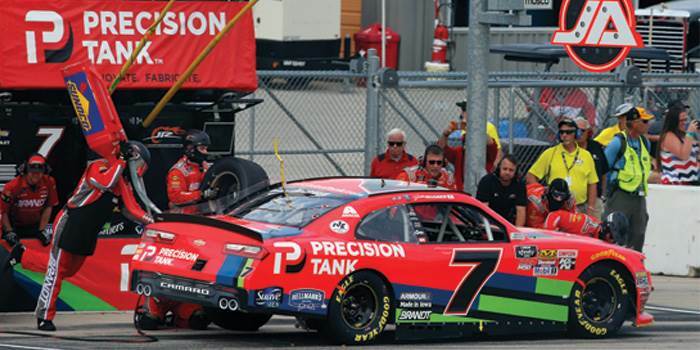 7 Precision Tank team nearly completed the sweep at Iowa Speedway, placing second in Saturday’s U.S. Cellular 250 after the race went into overtime. 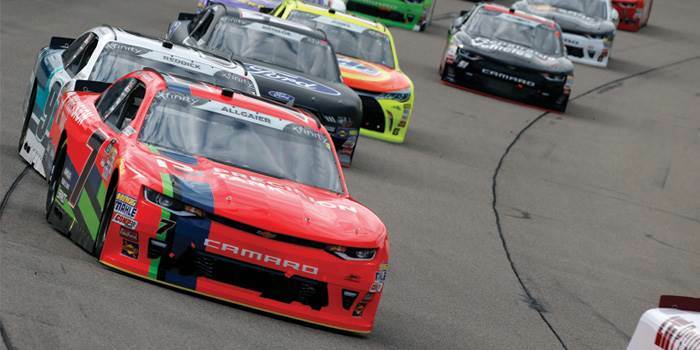 The Illinois native earned valuable points in each stage and led for six laps, increasing his season total to 496 laps led, a new career-high for the JR Motorsports driver in a single season. 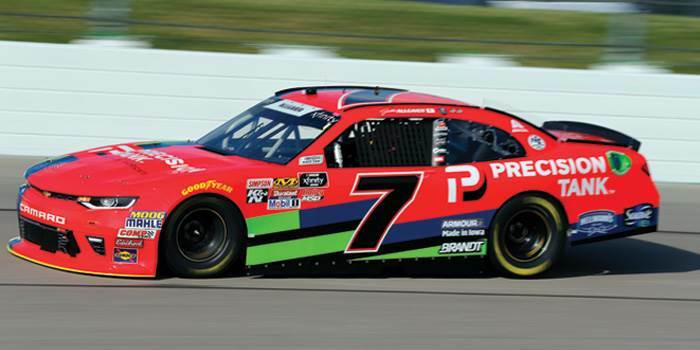 Qualifying seventh for the 250-lap race, Allgaier remained inside the top 10 for the first stage while battling a tight-handling condition through the center of the turns and a free condition on exit. Allgaier was scored in the sixth position at the end of Stage One and the team made a stop for four tires, fuel and a wedge adjustment. Taking the green flag for Stage Two in fifth on lap 68, the 32-year-old driver battled for position, falling back to sixth at one point. 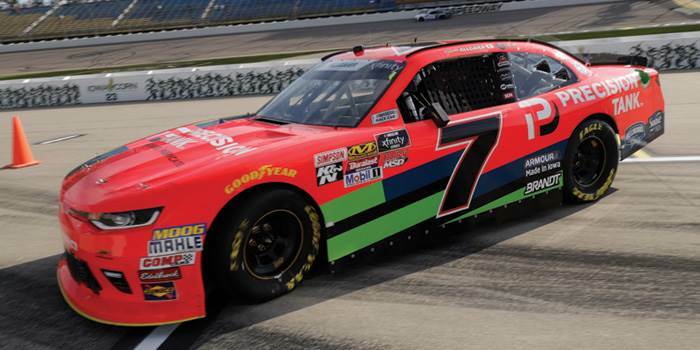 As the run went on though, the handling of Allgaier’s Chevrolet started to come to him as he advanced his position up to third by the end of the stage. Under the caution, the driver of the No. 7 relayed that he just needed to turn a little better through the center. Crew chief Jason Burdett called Allgaier to pit road for four tires, fuel, another wedge adjustment and an air-pressure adjustment. On lap 130, Allgaier started the final stage from the fourth spot and was up to second in a hurry. He maintained the position until lap 140, when Christopher Bell made the pass. He was running in fourth when green-flag pit stops began as the race was nearing lap 200. The team called the JRM driver down for four fresh tires, fuel and an air-pressure adjustment. Allgaier was running in third when a caution came out on lap 237 and the team opted to stay out. Back under way on lap 244, Allgaier went to the bottom, making it three-wide going into Turn 1. He was scored in the fourth position when yet another caution came out for a wreck, sending the race into overtime. The field went back to green on lap 250 and Allgaier made an impressive move to the outside, taking the lead just before another wreck brought out the caution and eventually the red flag. He chose the outside line for the ensuing restart and retook the lead, but the No. 20 of Bell caught the No. 7 and the two battled it out, with Bell ultimately taking the checkered flag in first. Allgaier claimed the runner-up spot and was followed by Kyle Benjamin, Ross Chastain and John Hunter Nemechek to round out the top five. Allgaier remains fifth in the NXS point standings, just 52 markers behind the leader.